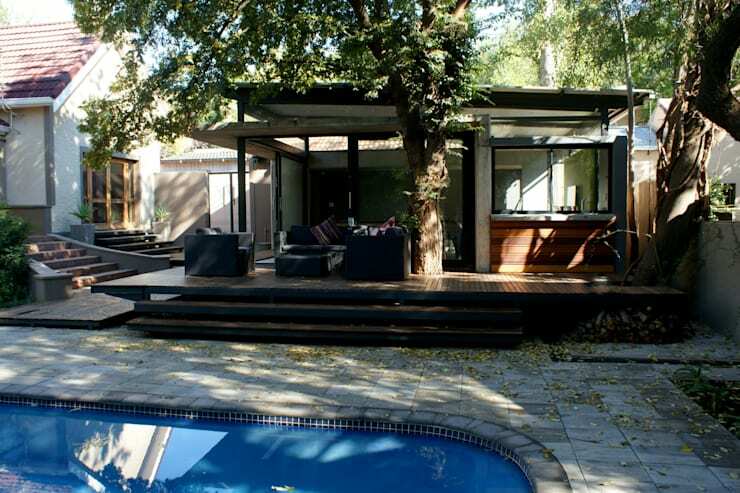 Bloemfontein-based architect professionals, SM!T Architects, were requested by clients to add a modern element to their traditional Waverley home. They wanted a playroom where the kids could play and entertain themselves, which would also double up as a guest room. Because of its close proximity to the swimming pool and gorgeous garden, this room needed to also be used for a third function: a pool and entertainment room. Today, we will witness how the designers rose to the challenge, creating a beautiful and modern playroom that will leave us all wanting the same one in our homes! 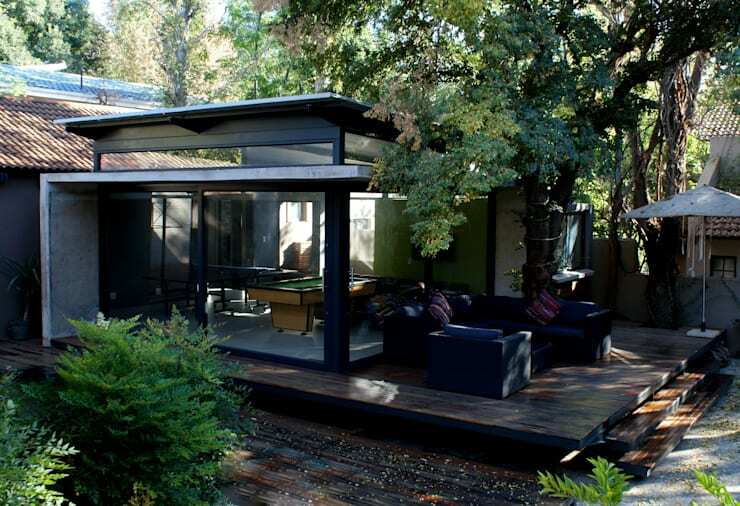 The first thing we notice about this addition to the home is its integration of the outdoor and indoor spaces. The playroom features glass doors throughout, which can be pulled open so that the interior spills out onto the exterior. This not only allows for plenty of sunshine and ventilation throughout this modern space, but it also makes it that much bigger if need be. 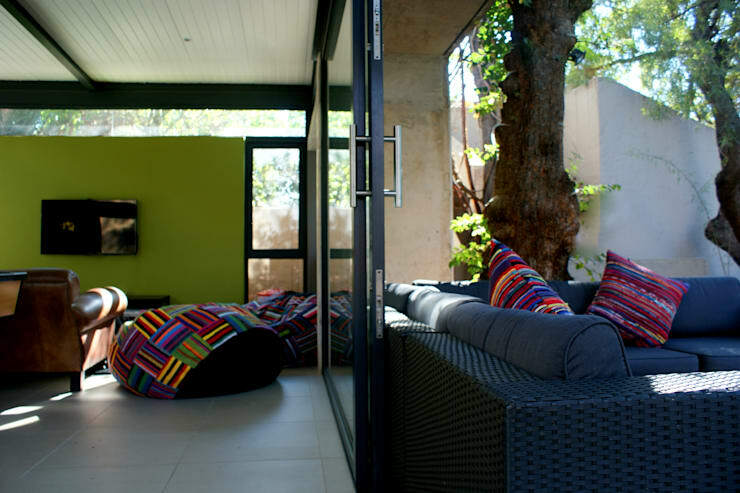 On the right-hand side, the designers have included a little patio area with trendy and durable patio furniture. This serves as a comfortable spot where guests, the kids or even the whole family can relax and enjoy the sunshine and fresh air. While two people are playing pool, the rest of the family can watch and support! In this image, we can see how the new playroom leads down to the pool area thanks to the wooden steps. In fact, the playroom is raised on a wooden deck, allowing for the perfect area to relax and stay dry if the kids are swimming! 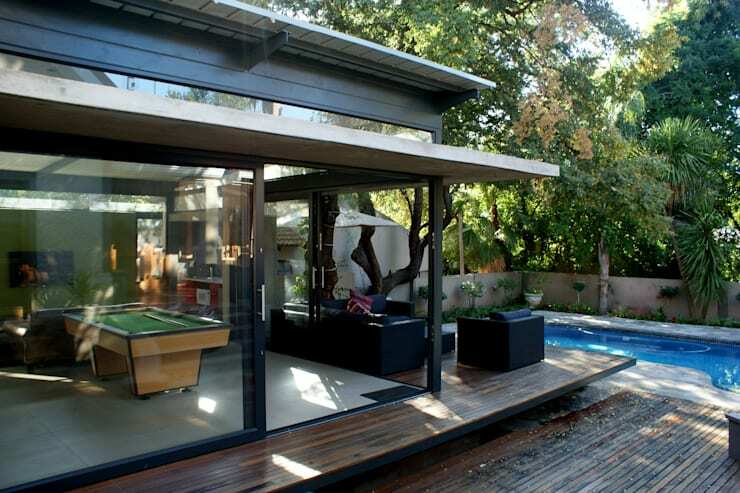 These two spaces have been perfectly integrated so that the pool area is that much more functional. Couldn't you imagine hosting a pool party here? There is plenty of space for swimming as well as sitting down, relaxing and playing games. This is a very social and interactive space. No matter where the parents are in this area, they can keep an eye on the kids. It also means that different family members can partake in different activities, but still feel connected to the rest of the spaces. If you have the space in your garden, a swimming pool is always a great addition. Have a look at these 7 steps to build a pool in your backyard. From this angle, we can see how the designers have gone for a very modern and minimalist look and feel. They've chosen neutral colours and materials including glass, wood and metal. This is very sleek! The glass encasing ensures that this structure doesn't impose too much on the garden and swimming pool area, allowing it integrate seamlessly into the nature that surrounds it. The designers have also ensured that it is both functional and design savvy. The furniture for the patio area as well as the pool table and other entertainment accessories in the room have been carefully selected, ensuring that this room doesn't become too overcrowded or messy. Yet it still remains a fun and entertaining space! If we look at the furniture used throughout this space a little bit more carefully, we can see just how inviting and cosy it is. The designers have gone for neutral furniture tones, but have added very colourful cushions and throws to them, ensuring that comfort and style collide. In the corner of the room, we can see how they've also painted a wall a lime green colour, creating a little bit more of a fun, funky and trendy space. This is an area where you are meant to enjoy yourself! The tiled floors are a great floor material for this space too. They will dry easily if the children run through with wet feet from the swimming pool, are easy to clean and they look stylish too. The designers have thought every detail through in this impressive playroom! Do you want a playroom like this in your house?